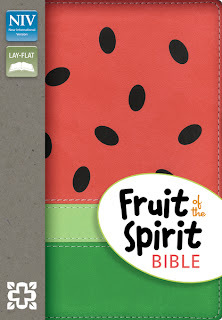 THE FRUIT OF THE SPIRIT BIBLE (Zonderkidz; $24.99 each; February 2013) teaches children that while some fruit grows on trees, the fruit of the Spirit, which grow within their hearts, are the most important of all. This New International Version (NIV) is easy to read and understand while digging into the Word of God. This Bible is small and easy for a child to carry to and from church. The Duo-Tone designs come in Grape, Watermelon, Strawberry and Brown letters with the Fruits listed. The Fruits of the Spirit is a great way to share with children the blessing that having the Spirit live inside of them will bring. Having a fruit cover will reinforce in them the need to desire these fruits as well. This Bible is great for young kids, yet 'cool' enough for teens to carry. I really love the design with the fruits and wouldn't even mind carrying it as an adult! Twelve full-color pages demonstrate each kind of fruit and shares how, with God’s help, readers can acquire each one.